There is nothing worse than a leaky pipe, clogged drain, or blocked toilet happening in the middle of the night or when you are having guests over. Fortunately, you can rely on the emergency plumbing services of We Do Plumbing Ltd to sort out any issues you are experiencing. If you require Emergency Plumbing Services in Canterbury, Ashford and surrounding areas, or are just looking for an obligation free quote, contact our 24/7 Emergency Plumbing Service via 01227 687 068. You can also read on to learn more about our services. Do you have a malfunctioning boiler that needs to be repaired or a new boiler that needs to be installed? We Do Plumbing Ltd can help! We are the leading provider of boiler repairs and installations in Canterbury. Our company has been serving clients in-and-around Canterbury for well over 10 years and has built a reputation for reliability, professionalism, and affordability. To learn more about our boiler repair, boiler maintenance, and boiler installation services contact us today via 01227 687 068 or via our contact form. You can also read on to learn more about the services we provide. Most people take their drains for granted until something goes wrong. Unfortunately, an unexpected drain blockage can cause a lot of damage to your property. It must be addressed as quickly as possible. Fortunately, We Do Plumbing Ltd is here to help! We are the leading plumbing, heating, and drainage company in Canterbury. Our team is available 24/7 to unclog your sinks, drains, showers, and toilets. We also perform drain re-lining, drain surveys, drain jetting, drain excavation and many other plumbing and drainage services. If you have a blocked drain, sink, or toilet contact We Do Plumbing Ltd via 01227 687 068 or through our our contact form. You can also read on to learn more about some of our plumbing and drainage services. 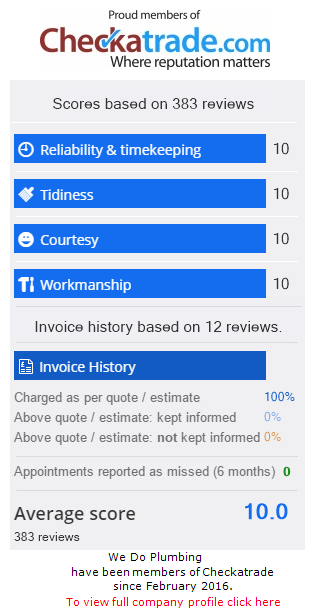 We are rated 10 / 10 on over 200 reviews with Checkatrade! We operate primarily in East Kent but service clients all over Kent and up into London. Please do contact us and we would love to help.